Last night we arrived late in the evening and checked into a beautiful bed and breakfast called “Neita’s Nest.” It was a soothing, very welcoming environment. The little added touches of candles in the evening and the smell of food cooking from the kitchen to a relaxed atmosphere for us weary, worn travelers. The proprietor, Michelle, made sure that we each were situated comfortably. I had a lot of work to do so I retired from the group early and went to my room. The next morning I woke thinking about how fast paced this trip had been and the things I wish I had gotten to do. I was having a few minuscule regrets but this is typical when travel involves work. Three of the storytellers headed to the airport early in the morning and I made sure to get up to see them off; Jeeva of India, Namsa and Zowda of South Africa. It was truly a blessing crossing their paths and sharing time with each of them. After seeing them off, I had another four hours before I had to head to the airport. I guess that Michelle, the owner of the B & B could see something in my eyes because, during a conversation, she volunteered to show me around Kingston. That got my blood flowing. There was only one place that I really needed to get to and that was the National Heroes Park where the body of The Honorable Marcus Mosiah Garvey lay in rest. It actually broke my heart somewhat to know that I had come so far and would be leaving Jamaica without paying respects to the memory of this great man. Michelle offering me this opportunity re-energized me. I had my shoes on in a flash and camera in hand. I was not about to miss this opportunity. We made it to National Heroes Park and Michelle gave me instructions on where Garvey’s memorial was located. 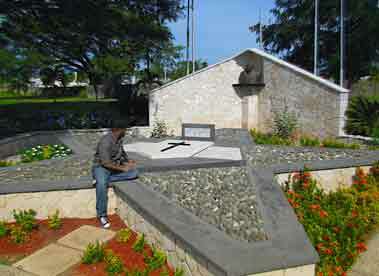 It was 1964 that Garvey’s body was brought back to Jamaica from England and interred in this National site. I will admit to having poked fun at people who visit gravesites of famous people and here I was doing pretty much the same thing. But for me Marcus Garvey is no ordinary hero, he is a symbol of perseverance and pride. I took pictures, sat for a while and walked around his memorial. It was an experience more than 30 years in the making. I learned of Marcus Garvey as a child, studied him as a young man and came to respect his struggle from a more mature vantage point as I aged. Following the visit to National Heroes Park, Michelle drove through Kingston and was the perfect tour guide, blending history with little known facts and humorous anecdotes. We made it back to the B & B just in time to catch the taxi for the airport. Once at the airport I began to decompress and reflect on my experience. While boarding the plane, I experienced one of those slight, dull pains to the heart that occur when you are leaving your family and beginning a long journey. I was returning to the U.S but the people of Jamaica had made me feeling as though I was leaving home.